Experience a society and culture committed to Compassion, Well-Being & Happiness. “Arrival is physical and happens all at once. The train pulls in, the plane touches down, you get out of the taxi… you can arrive in a place and never really enter it; You get there, look around, take a few pictures, then send post-cards home. When you travel like this you think you know where you are, but, in fact, you have never left home. Entering takes longer. It is like awakening slowly. And then one morning you open your eyes and you are finally here. You are just beginning to know where you are”. – Jamie Zeppa, Beyond The Sky and The Earth, A Journey Into Bhutan. 1999. Sunday, June 1. Day 1. Arrive Bangkok. Hotel conveniently located near Bangkok airport for ease of transfers. Monday, June 2. Day 2. Group flight to Paro, eastern Bhutan. Departs 6:50 a.m. Arrive Paro at 10:15 a.m. Elevation 7,300 feet. 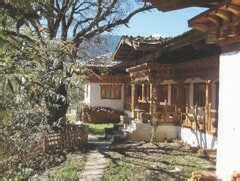 Check in to Tiger’s Nest Resort, (see photo below) situated in a serene pine forest in the idyllic Valley of Paro. The Resort has a direct view of Tiger’s Nest, the most celebrated monastery in Bhutan and with stunning views of Mt. Chomolhari, elevation 23,996 feet. After lunch a visit to Sissinang Nunnery, called Orgyen Chozong, home to nuns age 15-70, a place of education for women which provides a revolutionary step in the establishment of equality for female practitioners. The nunnery was founded and nurtured by Dilgo Khyentse Rinpoche, Tibetan Buddhist master and one of the Dalai Lama’s teachers and spiritual advisor to the royal family of Bhutan. Dr. Tashi Zangmo, Executive Director of Bhutan Nuns’ Foundation suggests we interact with the nuns by sharing some of our personal stories with them. One of the fortunate aspects of travel in Bhutan is that the majority of Bhutanese speak English. Dinner at Tiger’s Nest Resort followed by evening talk by Khenpo Phuntsho Tashi, author of Mindfulness in Bhutan and Director of the Bhutan National Museum. Khenpo was educated at Varanasi in Tibetan Buddhist Philosophy. He will be talking on the role of Buddhism in achieving Gross National Happiness (GNH). Tuesday, June 3. Day 3. After breakfast, hike Tiger’s Nest. Legend has it that 8th Century Guru Rinpoche flew here on the back of a tigress, and meditated in a nearby cave. This sacred site is at an elevation of 10,240 feet. Travel up the trail by horseback is an alternate option to hiking. Lunch is at a charming restaurant on the trail, with a spectacular view of the monastery. Dinner back at the Tiger’s Nest Resort, followed by Dr. Karma Phuntsho presentation. Speaking eleven languages, Dr. Karma was educated at Oxford University, and he is the Holder of Esoteric and Definitive Doctrines with Distinction (Lopen title). He was also awarded the Master of Perfection from the Nyingma Institute. He will be speaking on “Buddhism as an Act of Happiness”. Wednesday, June 4. Day 4. Early morning flight to Bumthang, (Jakar), spiritual heart of Bhutan, in the center of the Kingdom. Check in to Swiss Guest House cradled in an apple orchard. Artisanal cheeses made by the founding family. Mid-morning visit to Ogyen Choling gompa (monastery) complex and village, a religious and cultural sacred center in the Tang Valley. First visited in the 1300’s by the great Tibetan master of Buddhism, Longchen Robjan. He is the synthesizer of the doctrine of Dzogchen, School of Great Perfection. 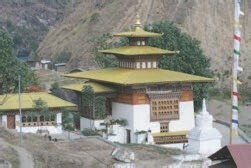 Ogyen Choling is also the ancestral home to Dorji Lingpa, also from the 1300’s, and spiritual heir to Longchen Rabjam. For 700 years Ogyen Choling has been one of the sacred centers or vessels of Tibetan Buddhist teachings and geneological lineage of unbroken lamas and masters’ teachings. We will view some of the best examples of early 20th Century Buddhist paintings in Bhutan. In the Drolma Chapel, we will view the Green Tara, Drol Jang, who is worshipped by devotees for Protection from All Harm. We will see the 21 aspects of Tara. We will also view the Buddha of Long Life, Amitayus. In the third chapel we will view the Dorji Sempa, the bodisattva who personifies the Purity of Enlightenment. and teachings, including the Heart Essence tradition. Here there are 1,000 paintings of Dorji Sempa, the bodisattva, on the walls and mandalas painted on the ceilings. 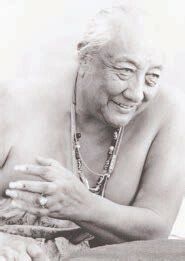 The Tibetan Buddhist master Dilgo Khyentse Rinpoche reflected, when asked by a young monk, what is the difference between money and enlightenment, and the Rinpoche said that “money you can finish … but enlightenment … you cannot finish.” We will experience through these one thousand paintings, the profound journey toward awakening. Additional time will be spent in the Ogyen Choling village and museum, learning about traditional fiber weaving sheep and yak wool, spinning, and dyeing. There will be opportunities to learn about the centuries’ old methods of sustainable agriculture practices in the Tang Valley of the Bumthang region, as well as ancient tools, trade routes to India and Tibet, food security and the salt trade, religious rituals, dance costumes, ritual objects, important astrology divination, dance masks and musical instruments. Lunch will be at the Swiss Guest House, once the residence of the older sister of the first King of Bhutan. After lunch a meditation walk-hike with naturalist Caitlin Bean in the verdant forests. Afternoon will include a visit to Jambay Lhakhang, one of the 108 monasteries built by King Songsten Goenpo in the 8th Century to subdue the evil spirits of the Himalayas. Mid afternoon visit to the sacred Kurjey Lhkhang monastery where Guru Rinpoche meditated and left his body imprint in the rock. If it is an auspicious day for you, you might squeeze through the famous rock formation… if you can, you will have a blessed, long life. This is the Queen Mother’s favored monastery, and we will have time to take in the profound essence of this sacred site, including seeing the cypress tree above the temple, said to have grown out of Guru Rinpoche’s (the re-incarnation of the Buddha) walking staff. Bumthang is a valley of Lhakhangs (temples) and is considered one of the most blessed and sacred valleys in the Thunder Kingdom. Before Guru Rinpoche’s 8th Century visit, Bhutan was known as Monyul, or land of darkness, meaning there was no light of spirituality. Evening dinner at the Swiss Guest House with delicately prepared Bhutanese cuisine and, if we are lucky, specialties of the Swiss house: fondue and raclette artisanal cheeses. After dinner (optional) traditional hot stone bath, meditations, personal time. Thursday, June 5. Day 5. After breakfast join naturalist Caitlin Bean on a meditation walk-hike in the peaceful Blue Pine forest, glacier-fed from the Chamkaar River. Bhutan is blessed with having 84.9% of its land with forest cover in tact, compared to 33% for the U.S., 56% for Cambodia, 37% for Thailand, 48% for Myanmar, 61% for Brazil, and 51% for Costa Rica. Forestry protection is a very conscious decision on the part of the Buddhist Kingdom, to be an environmental steward for all generations to come, and in harmony with all sentient beings. Thirty-five years ago Bhutan banned private logging. In our Pilgrimage Tour of central and eastern Bhutan, we will travel through, hike and meditate in, and luxuriate in, Broadleaf forests, Blue Pine forests, Hardwood forests, and tropical forests. We will see some of the 300 indigenous medicinal plants and 46 species of rhododendrons in the various and vast national parks and wildlife sanctuaries. Birder and naturalist Caitlin Bean will introduce us to some of the 415 resident bird species of Bhutan. Here, Caitlin is launching a candle offering in Membar Tsho, called Burning Lake, actually a widening gorge in the Tang Chhu river, the sacred place where Pema Lingpa, the revered treasure revealer in 1475 recovered holy relics hidden by Guru Rinpoche in the 8th Century. Early evening we will have a presentation by Dr. Samdrup, the Director of the Gross National Happiness Centre (GNH). The Centre was established under the guidance of the former Prime Minister, visionary Jigmi Y Thinley. Mandala featuring the Four Gateways to Happiness: Sustainable and equitable social and economic development; environmental conservation; preservation and promotion of culture; good governance. The GNH Centre promotes practical, mindfulness-based, action oriented approaches to living in the world in a sustainable and conscious way. The workshop presentation is designed for attendees to return home with practical ways to practice the tangible values of GNH in their daily lives, and at work, and in their communities and country. Late afternoon visit to Jakar Dzong and Jakar Village. Jakar translates as “White Bird”, a reference to the mythical white bird roosting at the site, signaling the auspicious location to found the monastery in 1549. Early evening shopping expedition in Jakar Village for textiles, folk art, hand-made kitchen utensils, prayer flags to purchase and have blessed by a lama and brought home … and precious encounters, the stuff to weave lifetime memories. Friday, June 6. Day 6. After breakfast, our journey to the wild, unchartered eastern Bhutan begins. We will pass through the village of Ura with spectacular, gushing waterfalls from steep cliffs and changing vegetation. The ThrumshingLa Pass (12,400 feet) is the highest elevation on the route. ThrumshingLa National Park is home to rare species of plants, birds and mammals, including the Royal Bengal Tiger, the Snow Leopard, and the Red Panda. We will have opportunities to walk, hike, and meditate in this vast, pristine wilderness… a profound place of old growth forest where 11,000 rural Bhutanese live in the outer buffer zone, demonstrating a harmonious balance between humans and nature. 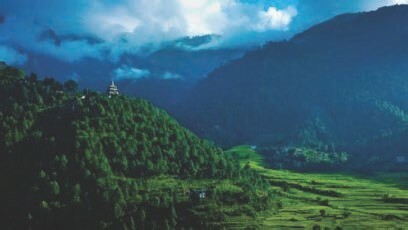 The Bhutanese Trust Fund and the World Wildlife Fund have supportive operations in this enchanting eco-system, a unique protected area presenting vast biodiversity, an area of 768 square kilometers (almost 300 square miles). Found in ThrumshingLa National Park are 341 species of birds, including the endangered Rufous-necked Hornbill, the beautiful Nut Hatch, the Ward’s Trogon, the White-Naped Yuhina, and the Brown Wood Owl. Birdlife International has recognized ThrumshingLa National Park as an important Bird Area in the Sino-Himalayan mountain forests. Join naturalist Caitlin Bean, walking these old growth forest wonder lands. Arrive Mongar. We will visit the Dzong and the intimate, charming and bustling town of Mongar. There is a feel of relaxed authenticity. Possibly watch the monks playing darts. A shopping opportunity for folk art, textiles, and prized buddhist thangka scroll paintings on silk . A photographers paradise! Saturday, June 7, Day 7. After breakfast, drive to Lhuentse (a district north east of Mongar), ancestral home to the Wangchuk dynasty, where we will visit the world’s tallest bronze statute of Guru Rinpoche at Takila, built by Nepali artisans and funded by devotees from Bhutan, Singapore and Taiwan. The 192 foot statute of beloved Guru Rinpoche is being built at this pilgrimage site following the prophesy by Lama Sonam Zangpo, a renowned Bhutanese Yogi, who said that a Guru statute in Takila would be most beneficial for the stability, peace, and prosperity of the Kingdom and the world. Many sacred statutes and other nangtens, as well as deity representations, being brought and gifted from Lhasa, Tibet, will be consecrated into the sacred statute of Guru Rinpoche. Drive on to Khoma village, where we will immerse ourselves with some of the finest weavers in Bhutan, making finely woven Kushutara brocades. We will have time to walk the village, experiencing daily life. Sunday, June 8, Day 8. Walk to Governor Dasho Sherab’s ancestral village of Tsakaling, where his cousin lives. We will spend the day sampling the local brew called ara and enjoying traditional dancing, and visiting local farmers. Those really interested in farming can participate in farm work. Monday, June 9, Day 9. Drive to Kadam Lhakhang, Chaskhar, and spend the day watching monks perform mask dances. Bazaguru Rinpoche will talk on Buddhism in daily life. Rinpoche is an incarnate, and is highly respected. More serious practitioners can receive empowerments and initiations as well. Blessed and with much contentment, we travel on to Trashigang area, checking in to Lingkhar Lodge. Tuesday, June 10, Day 10. After breakfast we will visit Gomphu Kora (Gomphu: meditation cave; and Kora: circumambulation) Temple, one of the most sacred places in eastern Bhutan. According to local belief, Guru Rinpoche meditated and subdued a demon here, leaving the impression of the demon’s body on the black rock behind the temple. Pilgrims, including nomads, circumambulate the temple and rock. A mere visit to this highly venerable pilgrimage site cleanses one of sins, fulfills desires and guides the path to Niravana. A single circumambulation brings more spiritual merit to the devotees than reciting the divine “Om Mani Padme Hung” 100,000 times elsewhere. In terms of historical antecedents, Gomphu Kora, is perhaps unequaled as a Bhutanese pilgrimage site. Continue on to Trashi Yangste and a visit to Zorig Chusum The School for the Sacred 13 Arts, to see young artisans being mentored 4-6 year apprenticeships. These include painting, casting, carvings, sculpture, gold and silver smithing, weaving, and paperwork. There is a deep spiritualism and wide patronage and appreciation for the artisans and their training. Results of their long apprenticeships are profoundly seen throughout the Kingdom: In architecture, homes, public buildings, temples, and folkart. We will visit the famous Chorten Kora built in the style of Boudhanath stupa in Nepal. The site is located by the Kulong Chu River in Trashi Yangtse. People come from all over eastern Bhutan and also Arunachal Pradesh, India, to this important pilgrimage site. We will visit Trashigang town, the principal market for the semi-nomadic yak herders. called Brokpa people from Merak and Sakteng, known for wearing sheep skin and yak wool and yak hair hats. Caitlin will lead naturalist walks in the forest. Visit Trashingang Dzong, the monastic fortress built in 1659, practically impregnable, protected on three sides by the Dangmechu River and ravines, and from behind by the mountains. It is known as “fortress on an auspicious hill”, and guarded against and defended from Tibetan invasions over many centuries by skilled Bhutanese archers. Inside the Dzong are many spiritual relics to view and to profoundly appreciate through our guides’ presentations. About Lingkhar Lodge: Called a serene hideaway in an orange orchard, a perfect setting for a nature walk with Caitlin, in the adjacent stunning forests in eastern Bhutan. The Lodge has six cottages and two grand buildings stunning examples of unique Bhutanese architecture, nestled in a quiet tropical setting with organic vegetable gardens and a full size, 475 foot archery course. Archery is the Bhutanese national sport. After all, that’s how they defeated the Tibetan invasions over the centuries. Wednesday, June 11, Day 11. After breakfast, drive to Radhi, the very eastern end of the national highway. The region surrounding Trashingang is known as the rice-bowl for eastern Bhutan, and Radhi is a famous village for exceptional weaving raw silk. A perfect buying opportunity for those who love textiles, and a relaxing time visiting with villagers. We will visit the Ranjung Lhakhang, a temple built in the architectural style of the Tibetans, and a monastic school supported by H.H. Garab Rinpoche, with the objective of promoting the Dudjom New Treasure Lineage and carrying out Dharma activities. Ranjung is a thriving community with four retreat centers and more than 300 monks and nuns, including tulkus and khenpos living in the community. Thursday, June 12, Day 12. After breakfast drive from Trashigang to Samdrup Jongkhar, 180km. We will stop at Kanglung, home to renowned Sherubtse College. For a long time this was the only college in Bhutan. Today it is a center of learning where, with its monastery, Kanglung brings together spiritual and secular learning centers side-by-side, that help young Bhutanese find the balance critical for happiness. 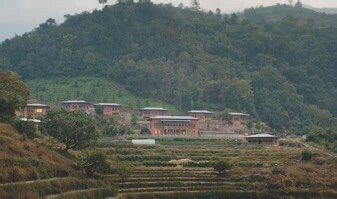 If time permits, we will also visit Khaling, one of the most famous weaving centers in eastern Bhutan. Friday, June 13, Day 13. 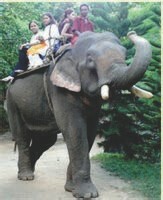 After breakfast we drive across the border into Assam, India, a land of lush greenery, and on to the Jungle Lodge. Assam is rich in culture and ethnic groups, and is known for Assam tea and for its rich biodiversity. Assam has successfully conserved the one-horned Indian rhinoceros from near extinction, along with the tiger and numerous species of birds, and provides one of the last wild habitats for the Asian Elephant. Saturday, June 14, Day 14. The Jungle Lodge is surrounded by serene tea plantations and the chattering bird sounds. Activities at the Jungle Lodge include bird watching, meditation walks, hikes, elephant rides, safari jeep rides, reading, reflection and relaxation. Perhaps … tiger molecules are nearby! Sunday, June 15, Day 15. Drive to Guwahati, India for 3:50 p.m. flight to Kolkata, India. Evening in legendary Kolkata, India. Monday, June 16, Day 16. Fly from Kolkata-Bangkok 10 a.m., arrive BKK at 2 p.m., onward to U.S.A.
Once… or twice in a lifetime, a place and perhaps a culture grabs your Heart. Bhutan is such a place. It is said “ Bhutan could become just like any other country, but no other country could be like Bhutan”. 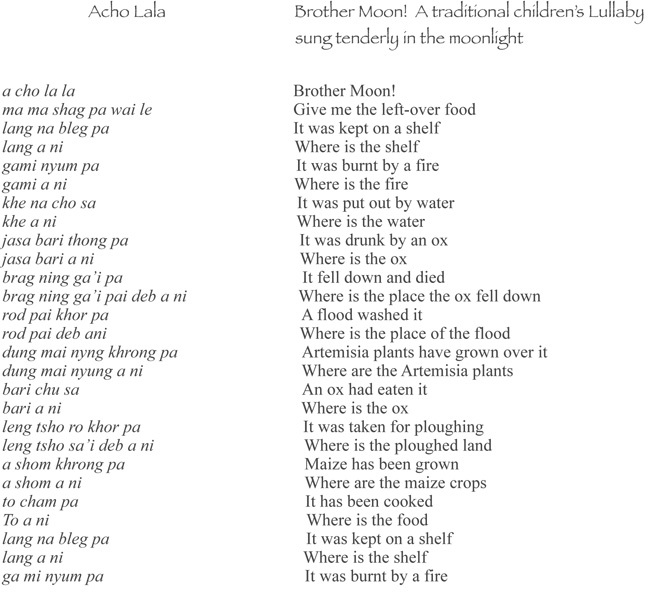 Acho Lala brings us to the Bhutanese gift, gently and compassionately unfolding ‘causes and conditions’, and the sacred connectedness of everything, and so much more. Hope to be with you in Bhutan in June, 2014.